Though the name Hebei may sound exotic, it literally means “North of the River”, thanks to the province’s location north of the Yellow River. With the Taihang Mountains in the south and the Yan Mountains in the north, Hebei is like a natural fortress nestled deep within the North China Plain. 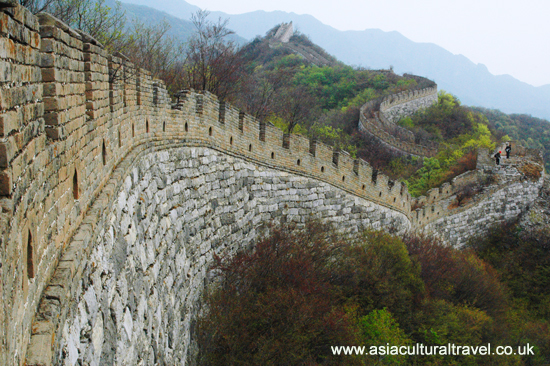 From east to west, the Great Wall winds its way through its northern reaches and terminates at the seacoast of Shanhaiguan in the northeast. The province rests in the north of China and borders Liaoning to the northeast, Inner Mongolia to the north, Shanxi to the west, Henan to the south, and Shandong to the southeast. Its location means it feels all four seasons in their full grandeur, from cold and dry winters and windy, wet springs to hot, humid summers and warm, balmy autumns. Temperatures plummet to between −22 to −3 °C (3-27 °F) in January and soar to averages of 17 to 27 °C (68-81 °F) in July. The municipalities of Beijing and Tianjin were both carved out of land that once belonged to Hebei, yet this isn’t the first time its territory has been reappropriated. During the Han Dynasty (206 BC–220 AD), it became a site of strategic significance, since it lay along the northern border, and defence of the region was paramount in order to prevent invasions from the Han people’s nemesis, the nomadic Xiongnu people. From this point onwards, Hebei would unfortunately change hands more times than a tennis ball in a Wimbledon final! When the Han Dynasty collapsed, the region came under the control of several warlords until it was annexed by the Kingdom of Wei (220–265). It then enjoyed some stability before it was plunged into the chaos of the Sixteen Kingdoms Period (304-439) and the Northern and Southern Dynasties Period (420-589). In the ensuing panic, Hebei would be conquered by the Later Zhao, Former Yan, Former Qin, Later Yan, Northern Wei, and Northern Qi dynasties respectively. Imagine potentially waking up to a new ruler each day, and that’s how the Hebei locals felt! It would only return to imperial rule when the Sui Dynasty (581-618) reunified China in 589. Yet even this would not last, as it was soon split up by several regimes during the Five Dynasties and Ten Kingdoms Period (907-960). It would be subsumed by the Liao (907-1125) and Jurchen Jin (1115-1234) dynasties before finally being reincorporated into China proper during the Yuan Dynasty (1271-1368). With such a disjointed history, it’s a small wonder the residents of Hebei aren’t constantly on edge! Nowadays, one of its most popular tourist sites is Shanhaiguan or “Shanhai Pass”, the easternmost end of the Great Wall. It is informally known as the “First Pass of the World” and nearby, in Beidaihe, there is a popular beach resort where top governmental officials used to meet. Yet, in a time when there were no fancy holiday destinations, it seemed the only logical solution was to build one for yourself! And that’s exactly what the Qing Dynasty emperors did when they erected the Chengde Mountain Resort; a UNESCO World Heritage Site within the province that is virtually unmatched in its grandeur. Another relic of the Qing Dynasty (1644-1912), the Western and Eastern Qing tombs, can be found in the southwest of Hebei and are also listed as a UNESCO World Heritage Site. They represent the resting place of 161 Qing emperors, as well as several other royal family members. So, in a place of constant upheaval, at least the dead can have some peace!